Sweet and salty popcorn mix with bursts of cinnamon candy and cookie crunch. Place red hots in a heavy duty ziplock bag and smash with a meat mallet or hammer to crush. Roughly chop Oreo cookies into rough crumbs/chunks. In a medium sized microwave safe bowl, melt almond bark according to package instructions until smooth. Add cinnamon oil to taste, if using. Pour mixture over popcorn and stir well to coat. Pour popcorn mixture onto a baking sheet lined with foil, parchment or a silicone mat and set aside. 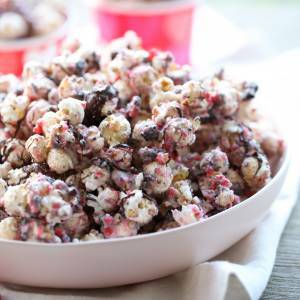 Melt chocolate chips and drizzle over popcorn mixture. Sprinkle kosher or sea salt lightly over mixture to taste. Let popcorn mixture harden, place in fridge to speed it up. When completely dry, break into chunks and just try to stop yourself from eating it all in one sitting. *Cinnamon oil (available online or at cooking stores and sometimes in the baking aisle) works well for this. You can use extract, but mix it in fast as it can cause almond bark to seize.